Give your guests a distinctive favor that is truly your own style. These charming, unique candle favors from Fashioncraft's Clearly Custom Collection measure 2.5" tall x 2" in diameter, in a classic holder shape. Each is made of frosted white glass with a poured white tealight candle inside. 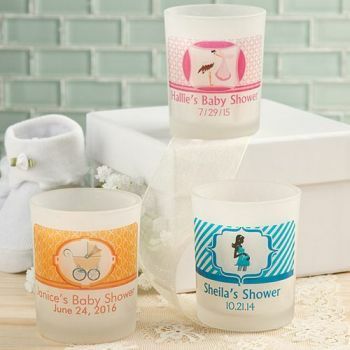 The clear stickers you can choose to adorn these frosted white glass votives with are offered in a wide variety of graphics, patterns and colors that match your theme and your personal preferences. The clear stickers can be applied easily, supplied on peel-off sheets and measure 2 .5" x 1.75". A perfect choice, these candle votive holder favors come bulk packed with the clear labels packaged separately . Please allow 3-4 days for processing as well as transit time for shipping to your location. Each measures 2.5" tall x 2" in diameter. The clear stickers can be applied easily, supplied on peel-off sheets and measure 2 .5" x 1.75"
Made of frosted white glass in a classic votive holder shape. Each has a poured white tealight candle inside. Perfectly fit for adding the clear sticker design of your choice right on the side of the glass. I bought these as gifts for baby shower guest, they are absolutely beautiful and will be a wonderful keepsake for all our family and friends who come to help us celebrate the birth of our first grandson in 10 years!!!!! !